I tried to be a bit more free and loose with my cutting style this time. But it doesn't work like that with paper cuts. You can see at the bottom I've been too relaxed and made wobbly thicks and thins. Bad form. The trick is making a design that looks relaxed and fluid, but cut it out in a very controlled manor so as to define the design perfectly. I now officially have the coolest bedroom wall in the land. Inspired by the Mustard Cafe, my wonderfully daddy kindly put up a picture rail for me. This is so ideal for me as I'm very indecisive and like to change things around often. Far left: 2014 Moon Calendar by Jeremy Rendina – a Christmas 2013 gift. This print is letterpressed by hand. The spiral design shows each phase of the moon daily. I can't always see the moon from my apartment so I'm pleased to look up what it's doing. Left of the centre: A small block-mounted piece made for me for Christmas 2012. Right of the centre: A recreated piece, as they no longer printed this piece with Pluto in the design since is was denounced as a planet in 2006. I like to remember how I learnt the planets when I was a child so I prefer to see Pluto included! Far right: A is for Astronaut – one piece of a full illustrated alphabet of screen prints, hand printed by Vicki Johnson in the Stew print rooms. I've been admiring her work for a long time – I love her use of shape and colour. Vicki was selling her prints in the Norwich Lanes Summer Fayre in July 2013 and am so pleased I bought it. Coming soon: Stay tuned to see what I do with my living room wall! Today a new department store opened in Norwich. 100% unique, Boutique Fusions sells "products and services offered by some of the best independent retailers in the UK." It's not even on the high street, it's THAT special. I'm a big fan of Norwich Lanes. I'm really excited that I have the opportunity to show my work in their beautiful exhibition space at the top of the building. On display is my epic 'Space Bunnies' paper cut and my #3 'Do More of What Makes You Happy' paper cut in a floating frame. 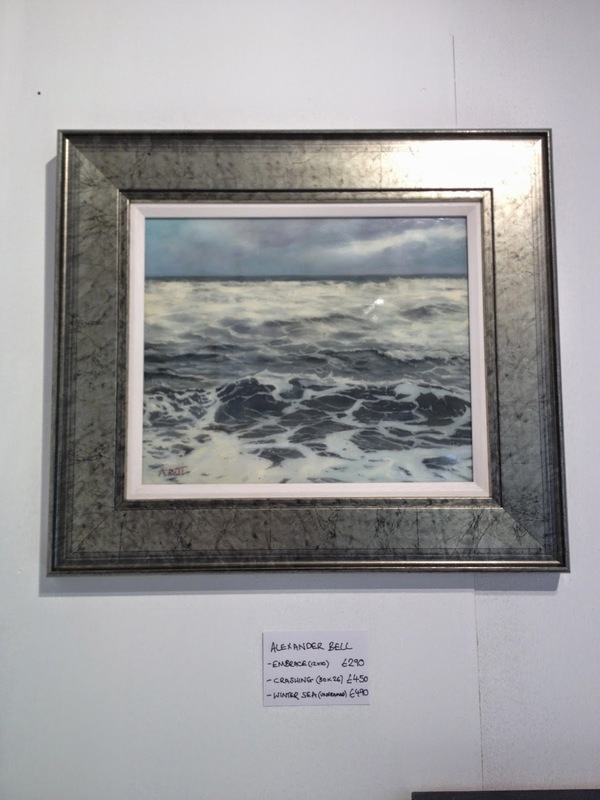 I'm very proud to be positioned next to an incredibly accomplished painter, Alexander Bell, whose seascape images really took my breath away. They are some of the most enjoyable paintings I've seen in a long time – I love their atmosphere. There's something captured in these paintings that gets flattened out and lost through photographic- and printing-processes. Something raw and honest combined with depth and mood. Absolutely stunning. To say I'm impressed is an understatement. I have no idea how or why, but I'm very proud to have have this new follower on Twitter! Someone who has been entertaining the globe via YouTube since 2009. I bloody love this guy! 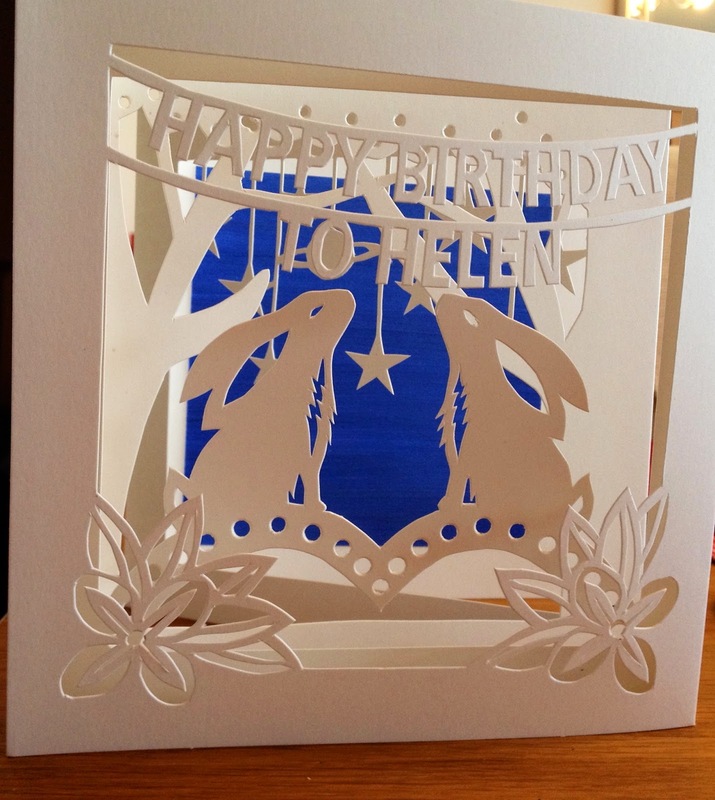 Happy Birthday Helen – special Space Bunnies edition card!